At The Crackerjack Shack, our team has over 150 combined years of experience in creating high-quality screen printed apparel. Screen printing allows for a wide variety of designs and techniques to be used, meaning that the apparel for your organization or business can truly stand out from the crowd. 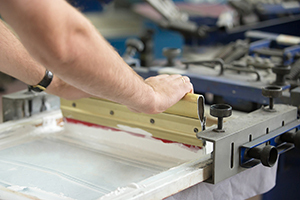 For our screen printing process, we use a combination of polished art compositions, top-of-the-line technologies, and high quality inks to create the best image on your apparel. We also use a rigid production schedule for every screen printing project which helps us keep your project on target with your deadline. We quality check each piece of apparel at every stage in the process to ensure that all of our customers receive the best products for their order. Every shirt that goes out our door is individually folded and sorted by size, so you can easily distribute them. Yes...EVERY SHIRT! Whether your order consists of 50 pieces or 5,000, we make sure your order is organized in a neat, professional way so distribution is easy once your shirts arrive. We don't charge all of those annoying fees that most apparel companies charge. Yes, there is an occasional art charge or set up charge in specific instances, but those are rare. Our customers are appreciative of our straight-forward pricing strategies! When we quote your job, the price we quote per shirt, is the price you pay. No surprises! bad reputation for sacrificing quality and consistently missing deadlines. NOT US! We follow a very rigid production schedule, and we have an employee in charge of quality control at every stage of your project. It's important to us to EXCEED your expectations, and provide a quality product to you when you need it. You can count on us! Contact The Crackerjack Shack Today! With over 150 combined years of experience and thousands of satisfied customers, The Crackerjack Shack is proud to offer the latest trends in screen printed apparel. We have a huge repeat customer base, which is one of the best compliments a business can get. If you're in the market for screen printing services, take a look at some of our past designs or give us a call for a custom screen printing quote. We also offer custom embroidery and a number of other custom apparel services. Check out The Crackerjack Shack website for more information or contact our office to get started on your next apparel project!